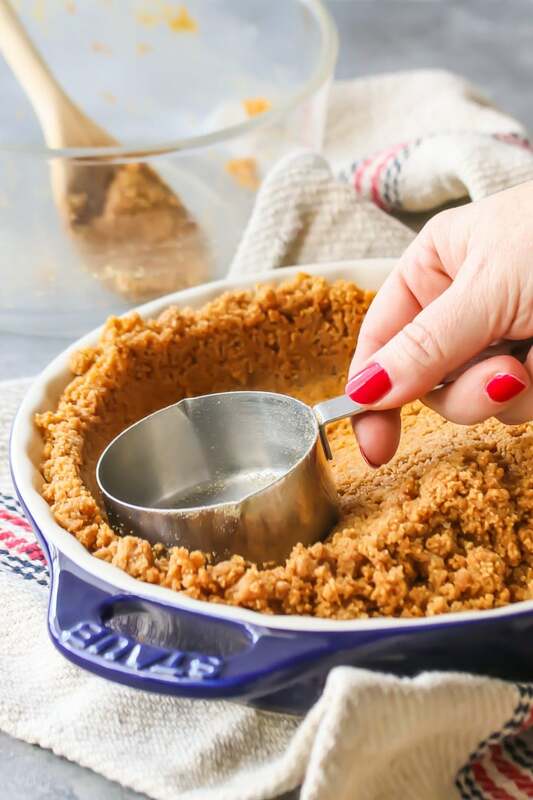 This is THE go-to recipe for homemade graham cracker crust: Buttery and a little sweet, with just a hint of cinnamon. Holds together well and isn’t too crumbly. Perfect for pies and cheesecakes! Graham cracker crust is a component in so many of the recipes here on Baking a Moment, I thought it was about time it got its due, with a dedicated post of it’s own! This crust can be used in tons of different ways, for pies, tarts, parfaits, and cheesecakes. The flavors are perfectly balanced: crunchy, buttery, and just sweet enough, with a hint of warm cinnamon. And it’s a snap to make (we’re talking like 5 minutes or less)! 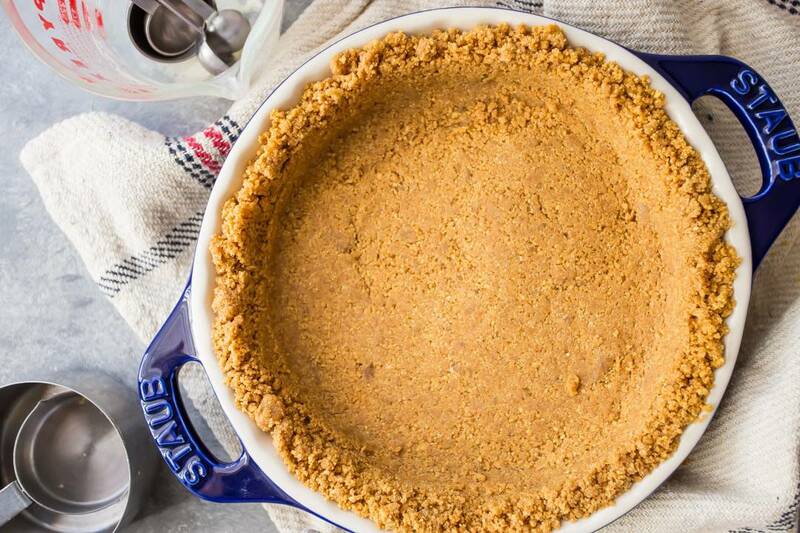 Let’s dive right in and learn how to make the best ever graham cracker crust! 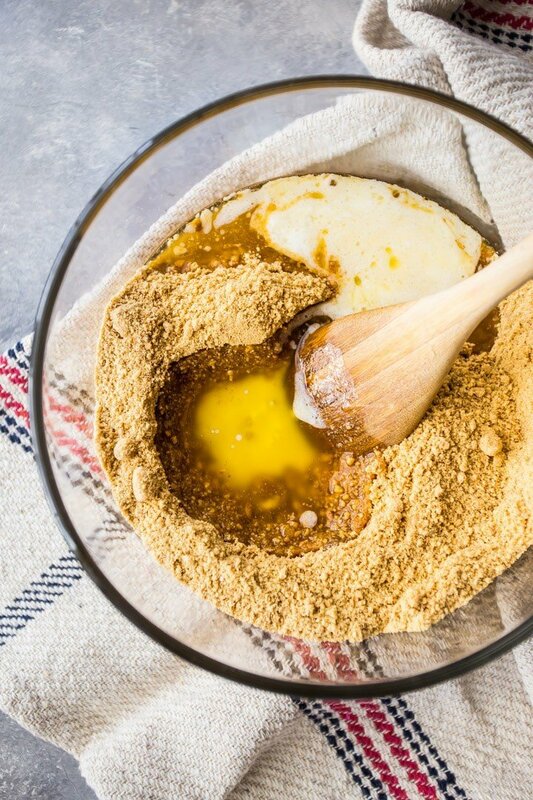 HOW DO YOU MAKE HOMEMADE GRAHAM CRACKER CRUST? It all starts with just a few basic ingredients. You’ll need a little brown sugar, cinnamon, and salt to flavor the crust. Melted butter will bind it. And, of course, graham cracker crumbs. I often use boxed graham cracker crumbs, but you can also grind your own crumbs in the food processor. Nine whole (rectangular) graham crackers will yield 1 1/2 cups of crumbs. It’s really very simple. Just combine all the dry ingredients in a bowl and then stir in the melted butter. The mixture has a consistency similar to damp sand. 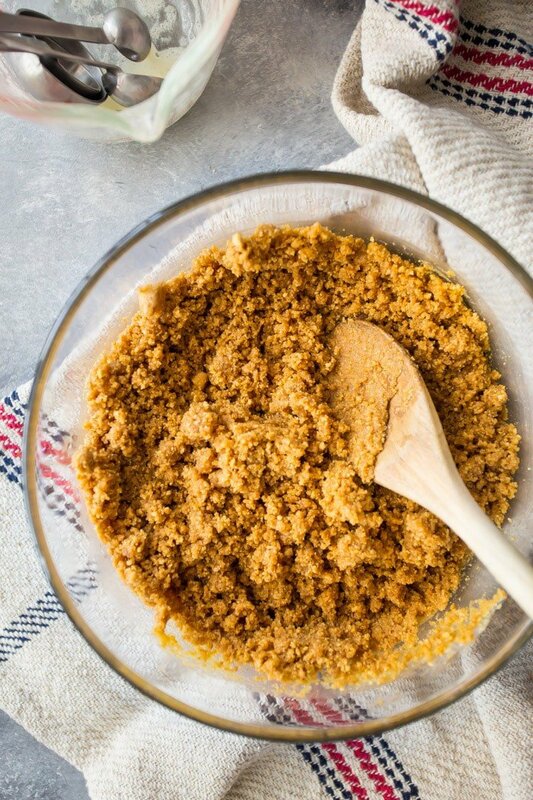 Stir it together until all the graham cracker crumbs are moistened, then, tip it into your pie dish or cake pan. I like to use a measuring cup to press it into place. It’s up to you if you want to go up the sides of the pan or not. If I’m making a pie, I’ll typically go up the sides, but if I’m making a cheesecake I prefer just one even layer on the bottom of the pan. 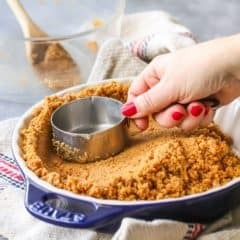 SHOULD I BAKE MY GRAHAM CRACKER CRUST? You can bake it if you want, but honestly it’s not necessary. Homemade graham cracker crust can be baked OR chilled. Both will achieve the same result. If you bake it, the sugar will melt and then as it cools it re-hardens and sets the crust. If you chill it, the melted butter becomes firm again and that will also set the crust. That’s why graham cracker crust is so great for no-bake desserts! 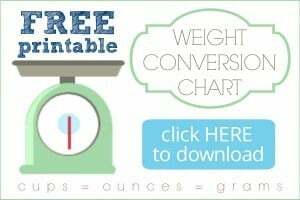 I tend to use it a lot in the summer, and I’m sure there will be some great no-bake dessert recipes here in the coming months. Stay tuned! But first, a word about crumbly graham cracker crust: I have tried some recipes where the mixture is so dry it does not hold together at all. When you slice into the pie or cheesecake, the crust just disintegrates and you’re left with nothing more than some dry crumbs, that don’t even stick to the filling. Needless to say, that is not optimal. So, this recipe has a good ratio of fat to starch, and it holds together very well. Your crust will not fall apart if you use this recipe! HOW CAN THIS GRAHAM CRACKER CRUST BE MODIFIED? If you don’t live in the US or can’t get your hands on graham crackers, there are lots of ways this recipe can be modified. Try using Digestive Biscuits or Maria Crackers in place of the graham crackers. For a chocolate crust, omit the brown sugar and cinnamon, and sub Oreo cookies for the graham crackers. (You do not have to remove the creme filling before processing the cookies into crumbs.) Famous Wafers will work equally well and are a little less sweet, if you can get your hands on them! For a vanilla cookie crust, omit the added sugar and cinnamon, and sub Vanilla Wafers for the graham crackers. If you really want to be a superstar, I even have a recipe for homemade vanilla wafers. Click here: Homemade Vanilla Wafers. If you love the combination of sweet and salty, try using pretzels, saltines, or Ritz crackers instead of graham crackers, like I did in this Nutella Pie. 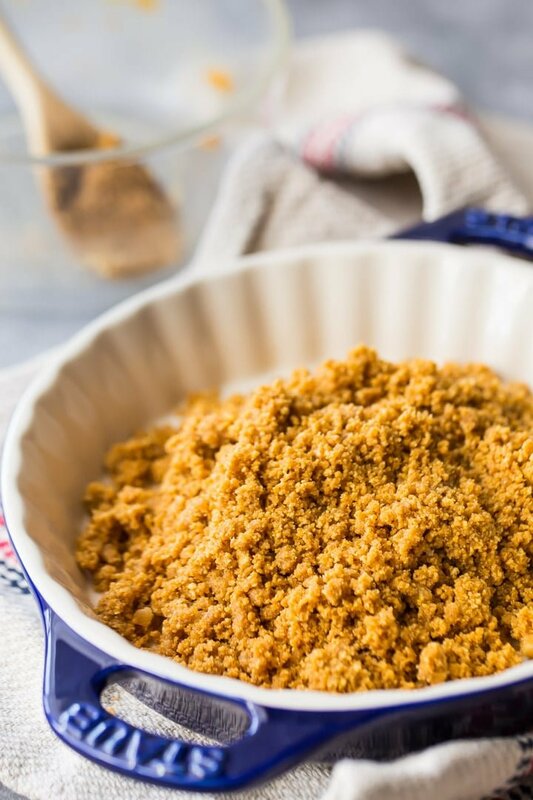 To make a gluten-free graham cracker crust, just use gluten-free graham cracker crumbs. You can also make it vegan by using a vegan butter substitute. Or you can always just make your own homemade graham crackers. They’re really good and so much fun to make! Click here for the recipe: Homemade Graham Crackers. More great pie recipes on my “Pies & Tarts” Pinterest board! This is THE go-to recipe for homemade graham cracker crust: Buttery and a little sweet, with just a hint of cinnamon. Holds together well and isn't too crumbly. Perfect for pies and cheesecakes! 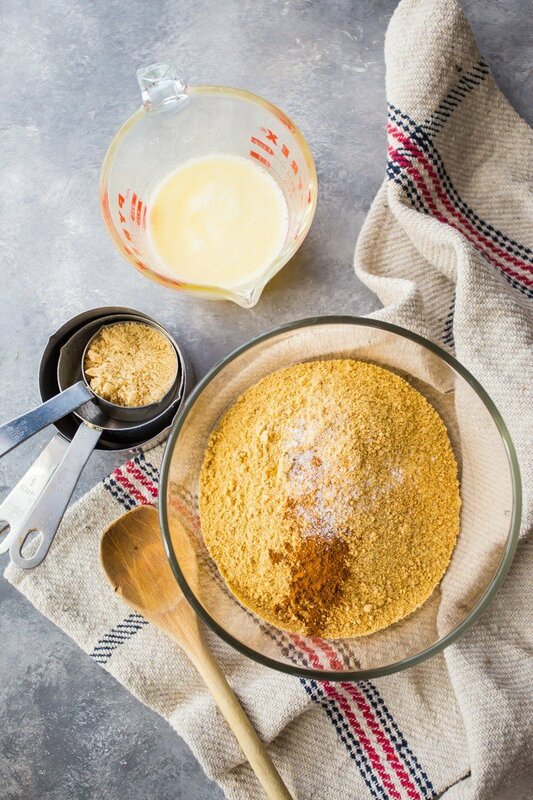 Place the graham cracker crumbs, brown sugar, cinnamon, and salt in a large bowl and whisk to combine. Pour the melted butter into the bowl, and stir the mixture together until mixed. Tip the mixture into the pie or cake pan, and press into the bottom and up the sides. Chill for 1 hour, or bake at 375 degrees F for 5 minutes. *Use boxed graham cracker crumbs, or place about 9 whole graham crackers in the bowl of a food processor and pulse until finely ground. 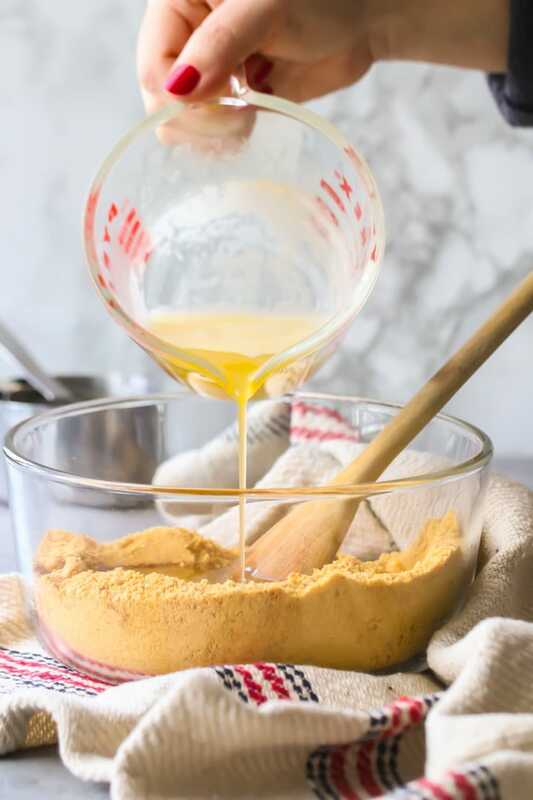 Next Post » Why use Cake Flour? The color is very different from digestieve biscuits wich i’ve to use cos we don’t have graham crackers in the netherlands. I wish we had them too cos i think the flavor is different from digestieve biscuits. Nevertheless i’ll use your recipe cos mine’s mostly crumbs when i cut the pie! I did something wrong i guess. So thanks for the recipe, i’ll try this one next time i’ll make a pie. Hi Marja! Do you have Lotus Biscoff cookies in the Netherlands? I think that would be a great substitute- very similar texture and flavor. I should have mentioned that in the post! I tend to use whatever recipe is on the back of the graham cracker box—I know yours is even better! I love graham cracker crusts and, you’re right, they can be used in so many things. Thanks for the great recipe! I love a graham cracker crust so much! I love a good graham cracker crust! 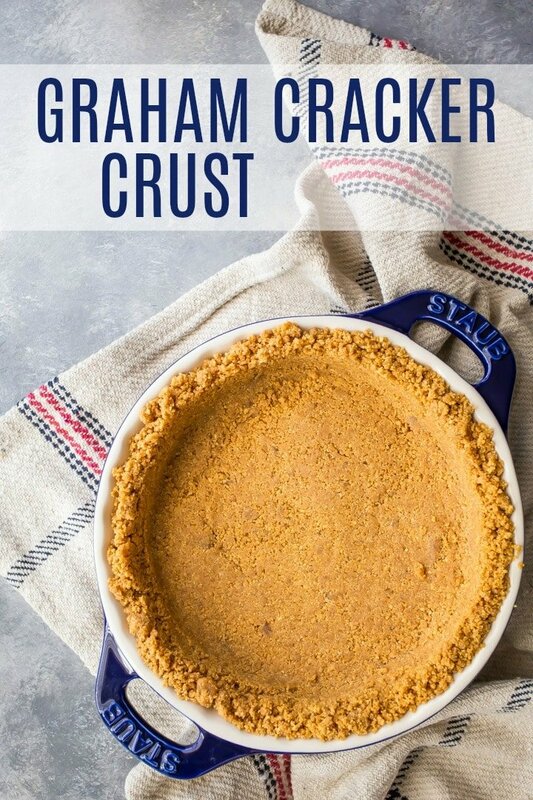 Graham cracker crusts are my favorite, i Use them as often as I can! Ohhhh!!!! this crust is such a perfect mix of sweet and salty. I can imagine using this as a base for a creamy pie – gosh, it would taste so divine! I usually put graham crackers in gallon baggie, close, crush with rolling pin. Keep in bag and mix dry ingredients then butter. No mes! Great tip! Thanks for sharing Carol! If your making a cheesecake do you bake your this crust first for the 5 min and then fill and bake again? Or just fill right away and it will bake while the cheesecake bakes? Hey Cat! It should work just fine for you either way! If you like your crust a little more firm then maybe do the 5 minute thing first. Good luck and enjoy! When you use a cracker crus, do you have to butter the pan? No it’s really not necessary to butter the pan when making pie, the butter in the crust keeps it from sticking. Good luck!